These accessible commentaries are for anyone who wants to enter a serious study of God?? 's Word. Each volume helps the reader think through the literary and theological issues in the text and provides correlation to multiple numbering systems for word study. It is an excellent resource for teachers, Bible study leaders, pastors, and growing Christians. 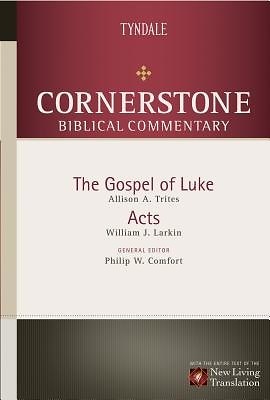 Includes the entire NLT text of Luke and Acts, translation notes, and fresh expository commentary. < br> < b> Rev. Dr. Allison Trites< /b> served as professor of Greek and New Testament at the Aacadia Divinity College in Wolfville, Nova Scotia, for 37 years. He has also provided leadership beyond the walls of the college, having served as president of the United Baptist Convention of the Atlantic Provinces, chair of the Deacon?? 's Board of the Wolfville Baptist Church, Baptist representative on the Canadian Council for Theological Education, as well as countless other volunteer positions.< br> < b> Dr. William J. Larkin< /b> is an ordained minister in the Presbyterian Church in America and has an active ministry in adult Christian education, particularly Bible teaching. He holds a B.A., 1967, Wheaton College; B.D., 1970, Princeton Theological Seminary; Ph.1975, University of Durham, England, and has served in various pastorates as well as being on faculty at Columbia Biblical Seminary and School of Missions since 1975. He also served on the Bible Translation Committee for the NLT.